My mom Theresa is a superhero. She raised my sister and I solo after my dad died. I was just shy of a year old, my sister was about eight. She had to go it alone in a new country, one she had only called home for three years. We were very poor, but always well fed, tidy and somehow she still found a way to spoil me whenever she could. 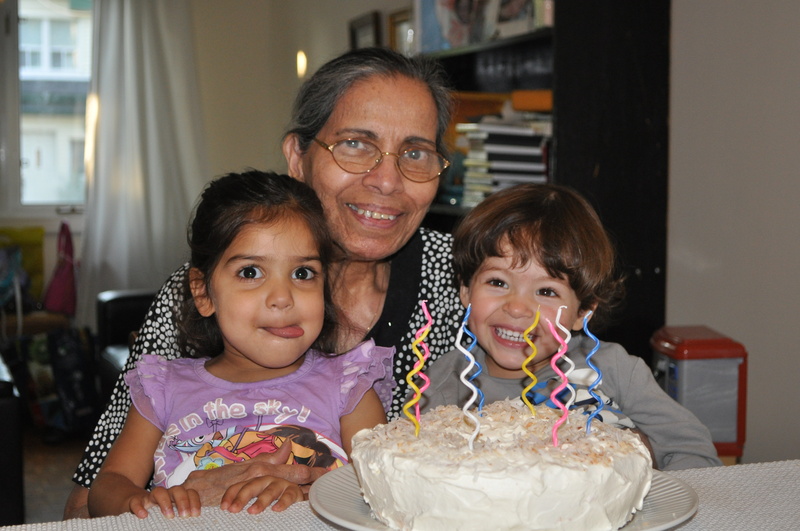 So when she turned 80, I vowed to make her the most delicious cake I could find. She requested coconut flavour but the rest was up to me and my husband Kevin. He picked an angel food cake, stocked up on all the ingredients, then promptly left to take our son Elijah to the park. Yikes. It was daunting at first but if you don’t deviate from the recipe, it’s totally worth the effort. The texture is ethereal, yet moist. The crumb is tender. The whipped cream frosting is the perfect topper, with a lightness that mimicks the feather-like insides. And it makes a very dramatic entrance with its sky high tallness. The butter fanatic that I am was first offended by the recipe’s complete absence of fat. And I was downright petrified of its 12 whipped egg whites. But trust me. If I could pull it off it can’t be that hard. And if you’re not into coconut, just omit it. I’ll give some other flavour options at the bottom of this recipe. Egg whites should be cold. Preheat the oven to 350 degrees F. Have a well washed ungreased 10 inch tube pan ready. I used one with a removable bottom. I highly recommend it. Not to terrify you, but the minute the cake is removed from the oven it will start to fall. So when it’s baked, invert it immediately. Yeah you heard me right. Turn the sucker upside down in the pan to prevent it from collapsing. 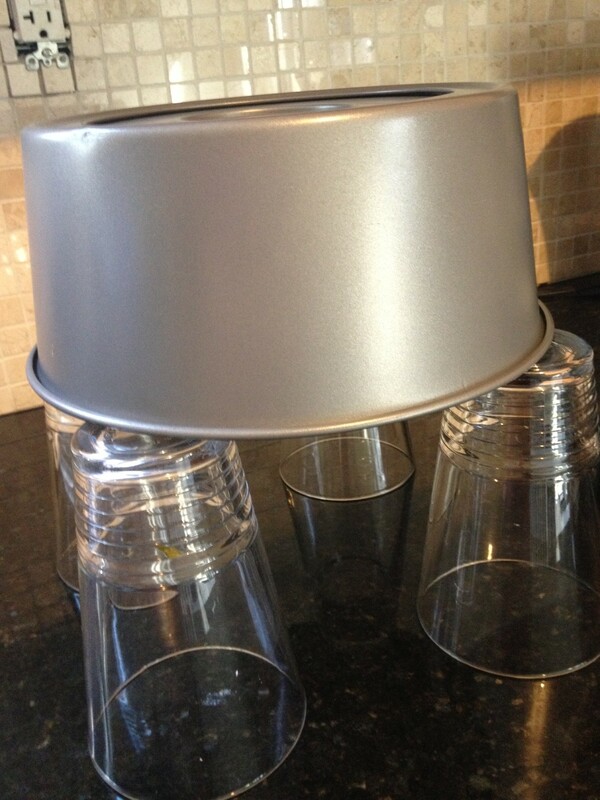 Turn four glasses upside down or four cans and rest the pan on them. In a large bowl, beat on low speed for 1 minute. When all the sugar has been added, the foam will be creamy white and hold soft, moist, glossy peaks that bend over at the points. Do not beat until stiff. This is really important because you do not want to beat until hard peaks, otherwise the cake may fall. 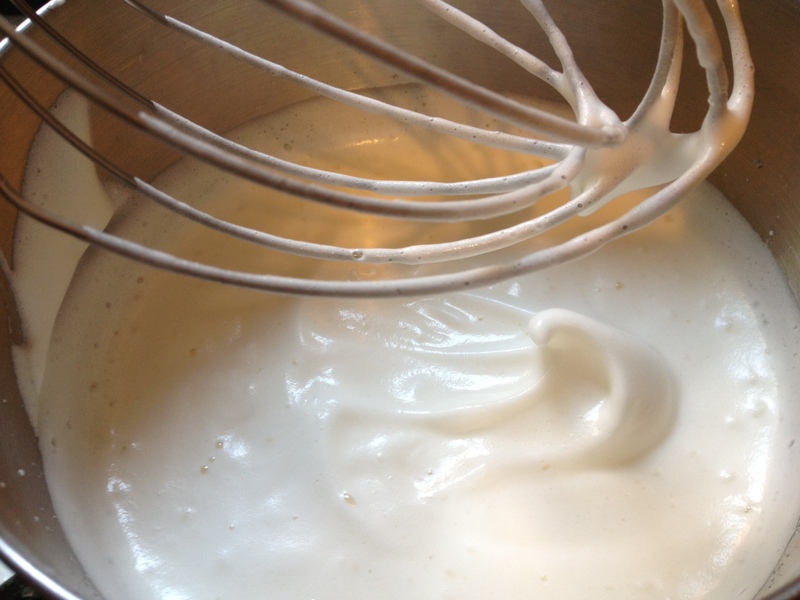 This is how the egg whites should look for soft peaks. If you’re using a stand mixer with a high-sided bowl, it’s best to transfer the mixture to a wide bowl with low sides. It’ll be easier to fold in the flour. Make sure to mix from the bottom of the bowl up so that no flour is lying in wait underneath the batter. Pour the batter into the pan and tilt or spread to level the top. Bake 35 to 40 minutes, until a toothpick or long skewer inserted in the center comes out clean. Invert immediately on glasses or cans. Cool completely for at least 1 1/2 hours. Frost with whipped cream and top with about 1/4 cup sweetened shredded dried coconut. Best to chill your bowl and beaters ahead of time. Beat until thickened 1 cup cold heavy cream. To sweeten, add 2 teaspoons to 2 tablespoons sugar, or 1 to 4 tablespoons sifted powdered sugar, or two teaspoons honey. You can also add 1/2 teaspoon vanilla. Lemon or Orange Angel Cake – substitute 1 teaspoon lemon or orange extract for coconut extract. Stir 1 teaspoon grated lemon zest or 2 tablespoons grated orange zest into flour mixture. Cocoa Angel Cake – substitute 1/2 cup unsifted unsweetened cocoa for 1/2 cup sifted cake flour. Dissolve 1 teaspoon instant coffee or espresso powder (optional) in the water. You can also add 6 tablespoons finely chopped semisweet or bittersweet chocolate into batter with final addition of flour. 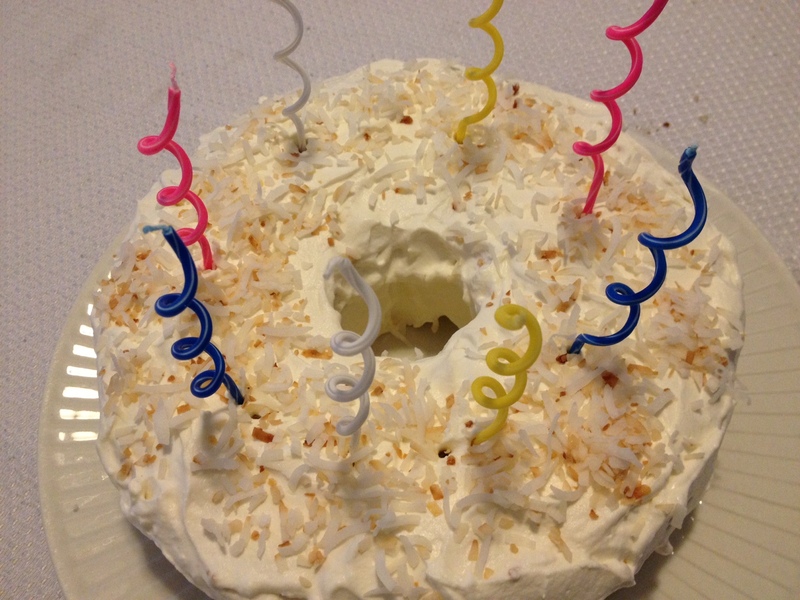 This entry was posted in Sweet and tagged Angel Food Cake, Coconut, Egg white, Whipped cream. Bookmark the permalink. I was the first to like it here. You’re obviously my biggest fan!